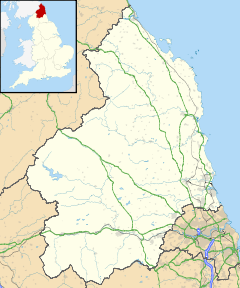 Longframlington is a small village in Northumberland, England, located on the A697, 11 miles (18 km) north-west of Morpeth and 5 miles (8 km) south-east of Rothbury. Longframlington is a former pit village and on the site of the pit now stands Fram Park, a log cabin holiday park. The village was previously the site of the Longframlington Music Festival. ^ "Parish population 2011". Retrieved 2 July 2015. ^ Hugill, Robert (1931). Road Guide to Northumberland and The Border. Newcastle upon Tyne, England: Andrew Reid & Company, Limited. Wikimedia Commons has media related to Longframlington. This page was last edited on 30 May 2018, at 01:15 (UTC).